@SysEPr I will track improvement for that. Thank you! Do you have a rough idea when the new version will be released? Are you shooting for Q1, Q2...? As of now the plan is to release the version 7 in Q2. More details will be available in April. Detail: In client tasks we can make a quarantine management task but we can define only period with date "OCCURRED FROM" to date "OCCURRED TO" so before after each run we must redefine this dates. Detail: Instead of use learning mode in a few workstations and then manually import and then merge the rules in the ERA, it would be nice to have the option to select some workstations and learn from them automatically the rules. So the only job the admin job is to only block or allow the ports. Detail: In the database tables we can find unused entries of tasks, policies (tbl_policies) and etc. so it will be nice if we can run a task and delete them. Detail: Ability to change the 32bit (limit 1280MB of memory) Tomcat 7 to 64 bit with a few simple clicks. Detail: It would be nice to instead of plain text to add HTML so we can add images links and more. Also the company logo is way to small in the page. Detail: Many times we have found that some workstations have slightly different policies from the policy that is used in their group. So can we monitor which computers have different policies if any and which options of the endpoint suite differ and all of that inside the ERA console? @SysEPr What kind of a problem you would fix by this? We are adding the option to search for "assigned user". Also, assigned user will be seen in the "client details". Why this is needed in the "computers" section? @pps Thank your for your feedback. This is being continuously added. Are there any specific symbols, that you would like to use for “group by” ? Does this mean, that you would like to basically schedule a task for “quarantine cleanup” for files older than XY Days? Would it be acceptable to have this as a policy setting? Does this mean, that you want to “merge rules” from multiple workstations, and convert them into the policy for the rest? Or how this should work? This was never possible. What kind of a problem you are trying to solve, by using the “Endpoint Firewall” on the Windows Server system? Does it mean, they are not beyond some physical network FW or? Can you provide a bit more information about this. As I am not sure, what kind of a problem you would like to solve by this. You have a task for that as of now. Or you can use the “run command”. In the V7 the issue with “not automatically performing reboot” after upgrade will be fixed as well. In V7, we will bring more granular options for database cleanup. However some of the tables, like TBL policies are not cleaned automatically. Why you want to remove them? Just to save the DB space? We will track improvement for that. What do you mean by this? Workstation has only the policy, that is assigned. However, workstation might have multiple policies assigned, meaning it could have a different “resulting configuration”. Also, settings not set via policy are “accessible” to the user, so he is able to adjust them locally. We are planning to improve the readability of the policies screen in a way, that it will explicitly inform the end-user about from where a specific setting is set. We do not have a target version yet, but it´s being tracked. My issue is that's hard to find computers that are not assigned to anyone. Let's say there is a fresh install, and it goes into the pool, but I don't necessarily know which one it is, but I definitely want to assign it to a user. For example, I had 25 computers today and only 24 were assigned to actual users, but I had to go through each computers one by one to figure out which one is not assigned. Explanation: For example I have the same antivirus threat in 20 workstations and I need a report or view that says I have this threat name and 20 occurrences. The same logic applies better in the firewall because there are ten of thousands of FW events. 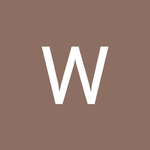 In FW I want to extract the DINSTICT processes from all workstations and the total count that they appear. Explanation: That will be okay too. Explanation: Forward learning modes from multiple workstations directly to ERA Console. From there we should filter DISTINCT rules from these workstations that we can allow or block. 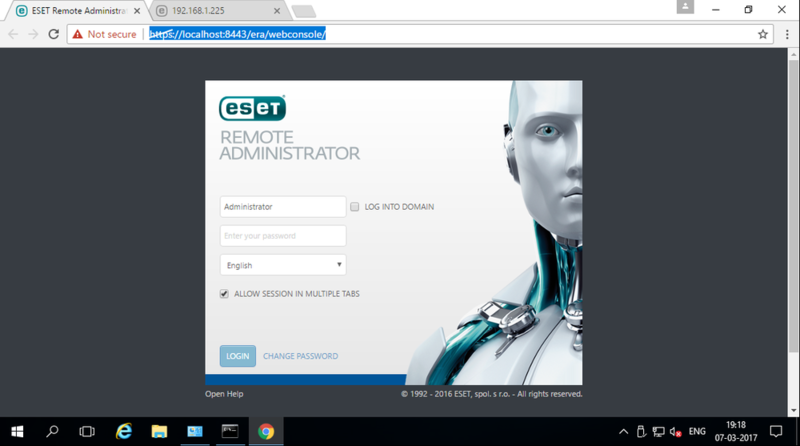 Explanation: Without eset firewall in in windows server you cannot monitor which applications are allowed and which blocked from inside the ERA Console. Explanation: Yes, the main reason is the DB size and the response in ERA Console. Explanation: For example an admin has made a change to a workstation1 and disabled the firewall then some other day has disabled the device control in some other workstations and forget afterwards to turn it on. Some time has passed and in a third workstation has disabled the initial scan and in another has disable the detection of potentailly unwanted application. So all four of them are in contrary of the ERA policies applied to the group that contains these workstations and should be an easy way to find out in dashboard and or reports. Secondly there should be an option through ERA console to force the above workstations to undo the setting changes and revert back to the one's of the policies . Detail: Every rule should be identified by a number, if a rule number is smaller from another that means that this rule is applied first. Detail: If you want to seperate the rules depending per application or per suite (office, adobe) or per use (rdp, teamviewer, ammyy ) then you should have the capability to use seperators before and after each group so they can be more easy to read. It will be even more interesting if you can expand and minimize each application group. This is not possible since the order of rules determines their priority. There's a Search function (a magnifier glass icon) where you can filter what you want, e.g. enter "Allow" to filter permissive rules. Or enter an application name to filter rules for that particular application, etc. 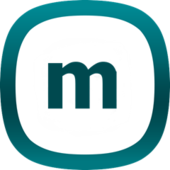 The rule editor is subject to improvement in future versions. Why not then add column "Order of rule application" when sorting when clicking on header? Detail: At this moment when You want to kill scheduled task, You need to find that task, then trigger and delete it there...There is no chance to delete trigger from station view...Delete task from computer view delete task...Thats serious issue...Same thing is with rerun task. It add new one instead of reschedule existing task. Detail: In our company we use a wifi network with captive protal (we enter the user and the password in a web browser page). 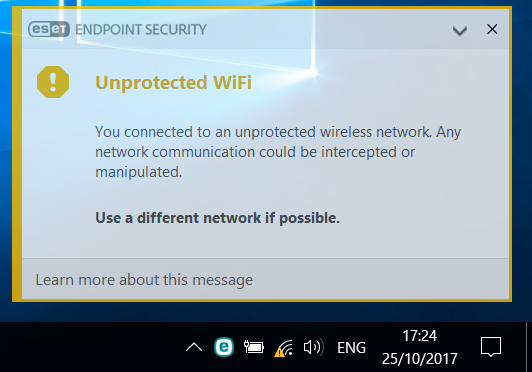 The endpoint client warns about unprotected Wifi. Is there any way from ESET Remote Adminitrator to supres s that message or exclude the warning for the specific network SSID? Detail: Should we have the option to remotely manage real time a specific setting in ESET Endpoint Security. Until now we must Request configuration to see what eset settings the workstation has and then to run a client task to change the setting that we want and the change is no real time. 2FA - I've heard rumours that in the next version of ERA, we will also be controlling Endpoint Encryption as well. I feel that it is imperative that some form of 2FA is used to confirm our login details to ERA. The days of a simple userid (which everyone knows, because it displays automatically), with a simple password are long gone. 2FA is already supported in the current version of ERA. I've missed that. Can you educate me as to how to enable it? Scrub that. I found it. Doh!!! Detail: admin/itsec receives plain text threat notification. He copies to another program, or forward as html. Receiver accidentally can click on the link (for example, when he tries to copy only the link). Restrict the login of the Administrator account to specific IP addresses, but allow other accounts with 2FA enabled to login from anywhere. As we cannot delete, disable or rename the Administrator account, the only other option is to only allow the Administrator to login from specified IP addresses only. Detail: it would be great to have more details about computer objects such as object history(when it was created, what was the previous hostname, etc). @LCS Thank you for your inputs. We are already tracking improvement for that (disabling the build-in administrator account). The recommended approach is to really use Administrator account as "backup" with high-complexity password, stored within secure environment. @Maxim. We are already tracking improvement for the "object created" / "first connected". I will expand it with the "previous hostname". Can you please elaborate about what should be behind "etc". If you have anything else in mind, please let us know. Detail: ERA has functionality to incorporate Apple DEP to manage restrictions to IOS Devices. It would be a wonderful feature to also incorporate the Apple Volume Purchase Program. Apple VPP provides a feature to manage IOS Apps deployed to IOS devices without having to configure an Apple ID. Where Apple DEP is already available within Eset ERA including Apple VPP would provide full circle MDM solution without requiring another application to manage the devices. Detail: It would be nice to have a setting on the new task creation page, to send an email to the task creator user, when the task is finished. The email could contain only a link to the task execution results, and maybe a summary about completion success or a successful/unsuccessful percent. Maybe if era is waiting for computers to be online, it could send reports repeatadly, containing the partial result, for example every 8 hour (or customizable intervals). Detail: In ERA5 we could view the process list when clicked "Running process". And we could do some sorting for example company, to see non-usual entries for first sight. In ERA6 we only see the list of processes when open the "Running processes" tree. Same apply for "File Details". It would be nice, if we could see the items below these "subkey" and could sort them. Example situation: check processes/filedetails running from outside windows\programfiles folders.